Every night, when their daddies tuck them in, Little Knight dreams of fierce knight-eating dragons and Little Dragon dreams of dangerous dragon-slaying knights. 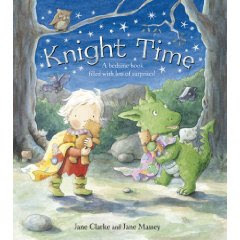 But one dark, stormy night, their two worlds collide and Little Dragon and Little Knight discover that they both have teddy bears and cuddly blankets - and they're not scary at all! It's silly to hunt each other!" they tell their daddies. And so it is. Simple language and powerful imagery shows up the nature of mistaken prejudices and uncovers the universality of night-time fears by using characters who are naturally scared of each other. The result is a reassuring bed-time book with a difference. This is a beautifully illustrated book with an incredible amount of detail included on each page. Each time I opened a page I saw something different, yet all the detail adds to and enhances the story. The story is delightful in the way it addresses the fears of a dragon and a knight. The parallel storyline of both merges well to bring the two lives together. A lovely book to share together at storytime. Follow the heartwarming and true story of Christian. The lion cub bought from Harrods, raised in a Chelsea flat and finally returned to live wild and free on the African plains. Christian's story is told in a scrapbook style, using original photographs of him as a cub. These images are both funny, moving and heart warming. The simple and accessible text, told in Christian's voice, deals with themes familiar to little ones - love, friendship, play and exploration. A unique story that has been brought to life by many incredible photographs. An informative and interesting book which educates the reader in the re-housing of Christian the Lion to Africa, and his plight in adjusting to the wild. I think children will be amazed by his journey and be delighted with his new life in Africa.